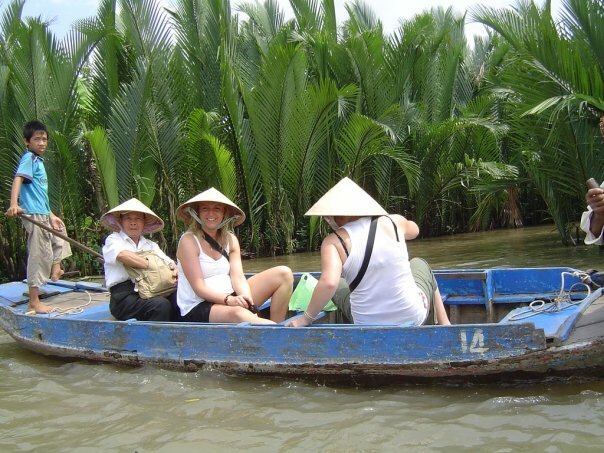 We finally decided on a Mekong Delta tour. 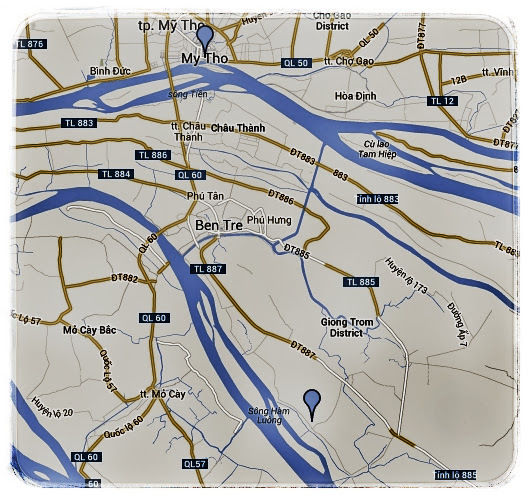 We left our big backpacks at the front desk of our hotel back in Ho Chi Minh City. Since we were coming back, the hotel staff agreed to hold them for us. I also left most of my money in the hotel’s safe. We then had a traditional Vietnamese breakfast of phở at one of the many phở restaurants before starting the day. Phở is also eaten for lunch and dinner in Vietnam. But it’s all the rave as breakfast. On the tour, we were taken to several places where we could buy stuff like coconut candy or things made from bamboo. There were countless opportunities for me to waste my money. This is probably why the tour was so cheap. At one point, we were driven around by a poor tiny horse. There were 7 of us in the carriage and the man kept trying to get the horse to go faster. 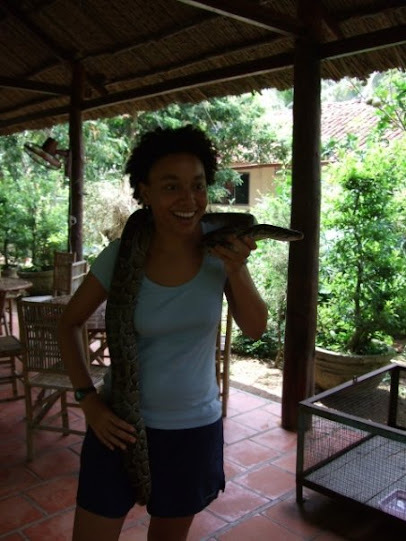 The horse took us to a place where we had free honey and tea and we could get our pictures taken while holding a snake. My group and I paid the extra money for a family stay. We thought that we would sleep in a bungalow near a Vietnamese family’s house and we would eat and socialize with our host family. That was exactly what we got, except that the family never seemed to want to talk to us. Other than at meal times, we never saw them. They were nice to us and cooked us very delicious meals, but we all got the feeling that they really didn’t like us. Water water everywhere, but not a place to pee. The next day on our tour, they boated us around the Mekong Delta from one place to another to buy more souvenirs and to look at things on the water. Just when we were all thoroughly sea sick and on the verge of tossing our cookies into the river, they let us go and we were able to stand on dry land again. There was a mad dash for the pay toilet. After our free pee we got on our bus and headed back to Ho Chi Minh City. Of course no long tour bus ride in Vietnam would be complete without several stops at gift shops to purchase everything from candy to nonsensical items like hundred-pound stone lawn statues. 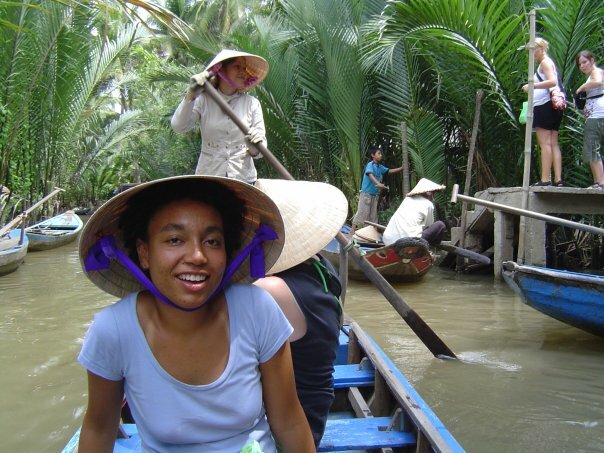 It seemed to me that people go to the Mekong Delta to say that they’ve been there. There isn’t a whole lot to do on the swampy land but look at it and buy crappy coconut candy. You can take a bus there or go with a tour group. Unless you have something particular to see, I recommend taking a tour group. Ask other tourists who have been there what group they went with, what it included, and how much they paid. 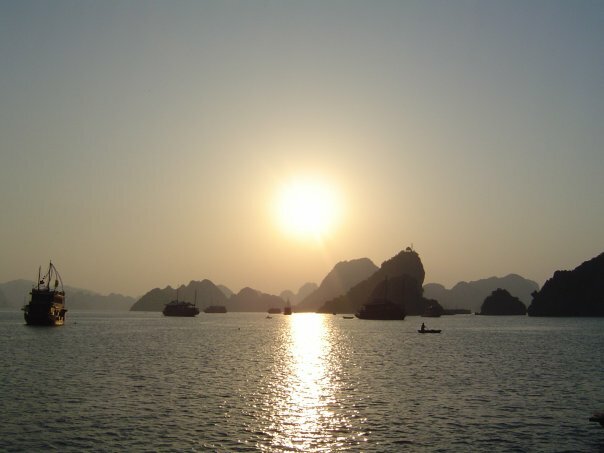 There are tons of agencies all over Vietnam that you can book a tour with. Shop around and do not ever feel pressured into buying a tour. Remember there is a high agency to tourist ratio in southeast Asia. And as always, if something seems shady, go somewhere else. You might not want to stay here for too long. You can’t swim in the water… well you can, you just might not want to. The bugs are really vicious in some seasons. And, it is freakishly hot! The extra money you pay for the home stay, might not be worth it. Try to find people who have done the home stay and ask them about their tour. Never go anywhere in Vietnam, southeast Asia, or the world for that matter without your own soft TP, Purell, and coins to pay to get into the bathroom.